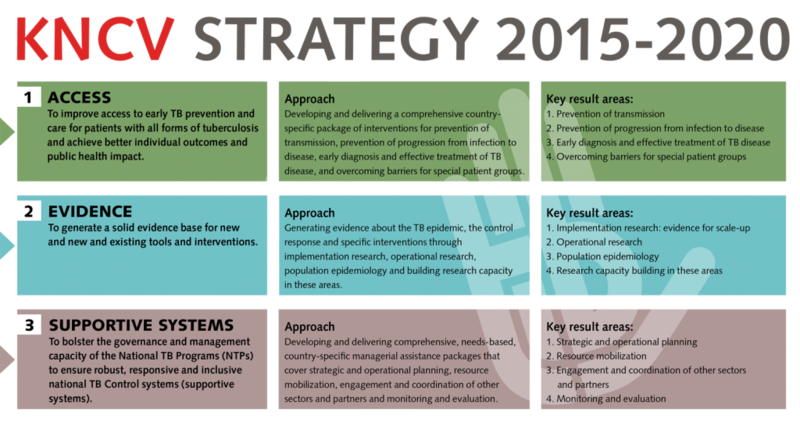 KNCV Tuberculosis Foundation’s work is rooted in the global strategy and targets for tuberculosis prevention, care and control, the World Health Organization’s END TB Strategy, and in the principles of the preceding global strategy: the ‘Stop TB Strategy’. The Stop TB Strategy (2006-2015) incorporated the DOTS (Directly Observed Therapy Short-course) strategy and encompassed the full range of specialist areas. These include: TB/HIV co-infection, TB drug-resistance, the needs of the poor and the vulnerable (including addressing childhood TB and TB infection prevention and control), health system strengthening, engaging all care providers including public-private partnerships, empowering people with TB and partnering with communities, and building an evidence base by enabling and promoting research. The END TB Strategy sets targets for TB prevention, care and control for after 2015, with a goal to end the global tuberculosis epidemic through integrated, patient-centered care and prevention. Supporting systems by bolstering governance and management capacity.